Marat Safin of Russia laughs at the short sleeves on his jacket after putting it on as part of the induction ceremony into the International Tennis Hall of Fame in Newport, Rhode Island, U.S. July 16, 2016. Marat Safin has become the first Russian to be inducted into the International Tennis Hall of Fame. Russian tennis player Marat Safin has been inducted into the International Tennis Hall of Fame. 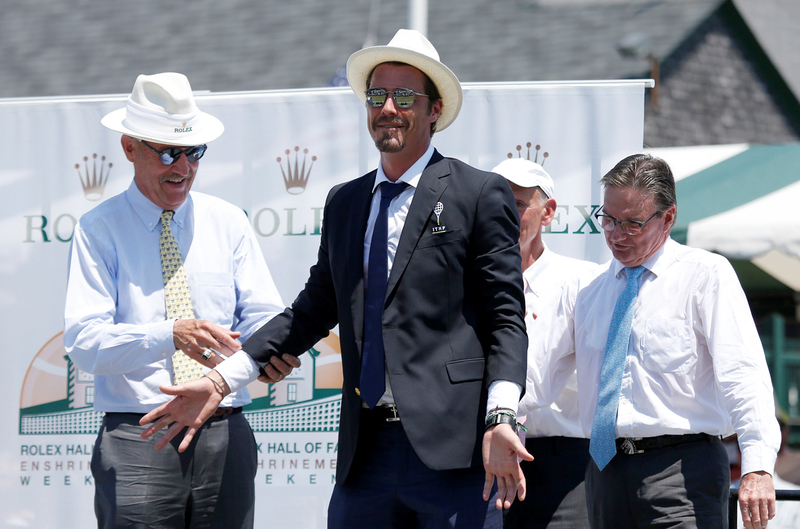 The induction ceremony was held on Saturday, July 16, 2016 in Newport, Rhode Island, in the U.S. Safin, whose professional career came to an end in 2009, is the first Russian player to be receive such an honor since the foundation of the Hall in 1954. The Hall of Fame honors tennis players who have made a significant contribution to the development of the sport. Its members include such legends as Andre Agassi, Pete Sampras, Boris Becker and Steffi Graf, among others. The Belgian tennis player Justine Henin was inducted this year along with Safin, 36. In his acceptance speech, the world’s former number one seed spoke of the great sense of camaraderie between tennis players in the early 2000s. "I'm a part of the last generation that could enjoy going out together,” Safin said. “We lived like a family. We traveled like musicians. It was more rock and roll." Safin himself is remembered by audiences not only for his resounding victories, which include the U.S. Open in 2000, the Australian Open in 2005, two Davis Cups and 17 ATP tournament wins, but also for his sincere and emotionally invested style of play. "When Marat took the court, you wanted to have the best seat in the house,” said former American tennis champion Jimmy Connors about Safin in his induction speech. “You never know what were you going to get. The tennis, you expected. Everything else was a bonus. And I loved the show." APRussia&#39s Marat Safin and his sister Dinara Safina talk during their doubles match against Italy&#39s Simone Bolelli and Flavia Pennetta at the Hopman Cup in Perth, Western Australia, Jan. 4, 2009. ReutersRussia&#39s Marat Safin practises at Melbourne Olympic Park January 9, 2008, ahead of the Australian Open tennis Championship. ReutersRussia&#39s Marat Safin&#39s broken racket is seen after he threw it at the ground during his match against Marcos Baghdatis of Cyprus at the Australian Open tennis tournament in Melbourne January 17, 2008. ReutersFormer Russian President Boris Yeltsin (C) celebrates with Russia&#39s Marat Safin (L) and Dmitry Tursunov after their victory over Argentina&#39s David Nalbandian and Agustin Calleri at the Davis Cup final in Moscow, December 2, 2006. APRussia&#39s Marat Safin left, argues with chair umpire Pascal Maria from France during his third round match against Andy Roddick of the U.S. at the Australian Open tennis tournament in Melbourne, Jan. 19, 2007. APRussia&#39s Marat Safin holds his Australian Open trophy on a Melbourne tram, in Australia, Monday, Jan. 31, 2005. Safin defeated Australia&#39s Lleyton Hewitt to win his first Australian Open title at Melbourne Park on Jan. 30. APRussia&#39s Marat Safin smiles as he sits on the court with his trophy after defeating the United States&#39 Pete Sampras 6-4, 6-3, 6-3 in the men&#39s singles final at the U.S. Open tennis tournament on September 10, 2000, in New York. Marat Safin acts as if he was taking off his shorts after loosing a point against Felix Mantilla of Spain during their second round match of the French Open tennis tournament at the Roland Garros stadium in Paris, May 27, 2004.